Everyone defines his or her ideal “Up North” getaway a bit differently. Some like “roughing it” and being close to nature, while others want to “glamp” it and enjoy all the luxuries of home. At Traverse City KOA, there’s room for these extremes and everything in between. “However you like to camp, we got you covered,” states Co-Owner, Cathy Kuebler. 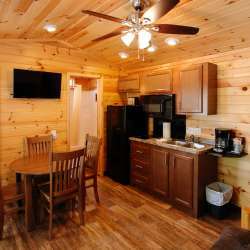 “We have rustic cabins, lodges with full kitchens, RV sites…your options are wide open here.” The campground has 21 cabins and lodges. 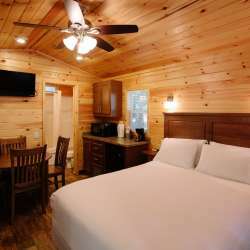 The cabins sleep up to four and the lodges, up to six. It also has over 90 RV sites, most with full hook-ups. “Just bring your food and gear and we’ll do the rest,” says Kuebler. By “the rest”, she’s referring to the many activities and attractions that families enjoy here, year after year. Take, for instance, the train that runs twice daily and takes guests— from two to 92—around the 20-acre campground. Or how about a remote control car track, for would-be Indy drivers? 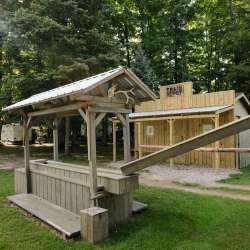 Other welcome surprises include a massive jumping pillow (think trampoline, but much safer), giant chess and checker sets, horseshoe pits, miniature golf…plus a myriad of activities like arts & crafts, bike decorating, a gemstone mining station, and more. Suffice it to say, boredom is never an option here. Located a few miles south of Traverse City, the campground is open from May 1st to October 15th. So, while it’s opened for a limited time, it offers almost unlimited fun. “We have a saying here,” explains Kuebler. “Offer a clean, healthy environment, with friendly service, and always give our guests something to do.” Traverse City KOA certainly does all of these.